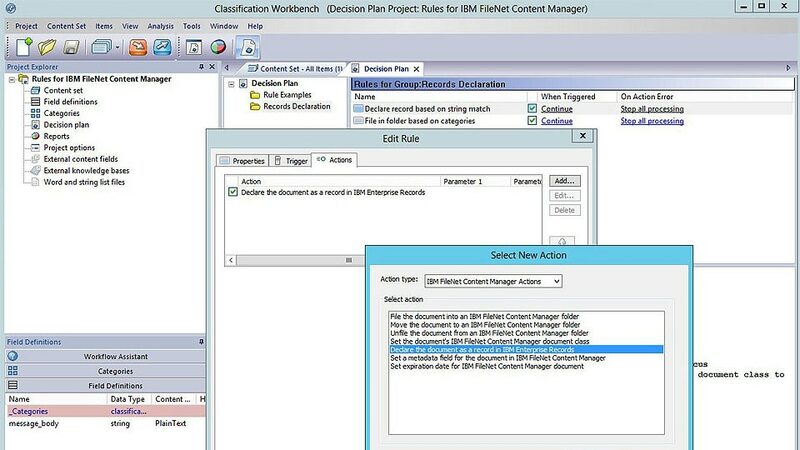 IBM Content Classification provides context-sensitive analysis and automation features to organize unstructured content. The solution categorizes unstructured information by analyzing the full text of documents and emails and applying rules that automate classification decisions. It can organize information by policies or keywords, and it can assign metadata that is based on, for example, the full context of a document. The solution works with enterprise content management and information lifecycle management software from IBM such as Datacap, Content Collector, Enterprise Records, StoredIQ® and Content Navigator. Provides content tagging and classification that is distinctive to your organization. Users can feel confident that information is accurately organized and managed. Filters out content, such as email about lunch appointments or documents that do not hold business value, to help ensure that only important content is retained, classified and archived. Provides natural language processing and semantic analysis capabilities to help determine the intent of words and content. Incorporates real-time learning that adapts to changing business needs. Classifies content to support records and retention plans. Enables control of records to help you comply with internal policies, government regulations or legal discovery requests. Allows you to move beyond simple keyword search to enable conceptual search that delivers a more relevant set of results.